In 2009, an independent and non-profit organization — 4 Tomorrow — was founded. Its aim was to encourage people to make posters to generate debate on important issues. ‘Poster for tomorrow’ is one of its projects under which the initiative ‘Draw me democracy’ has been taken to create awareness about democracy and build capacity for creative expression at the individual and institutional levels. It consists of a series of workshops in 12 countries across the world (four in Latin America, four in Africa, two in Eastern Europe and two in Asia). In that regard Will Georgi from Holland and Tommaso Minnetti from Italy conducted a workshop (from April 23 to 27) at the Karachi University’s department of visual studies. The workshop was coordinated by Khuda Bux Abro, Saima Zaidi and Durriya Kazi. Keeping with the theme of ‘Draw me democracy’, a two-day exhibition of posters made by second- and third-year students of the department and a couple of communications designers opened at T2F on Sunday. A variety of posters on one subject indicate not only the efficacy of the workshop but also the kind of talent that students have as well as their ability to understand concepts. Rabeea Arif’s intelligent use of a picture of half-a-face and the word ‘vote’ with the eye representing the letter ‘o’, is a direct interpretation of the subject without losing out on its aesthetics. 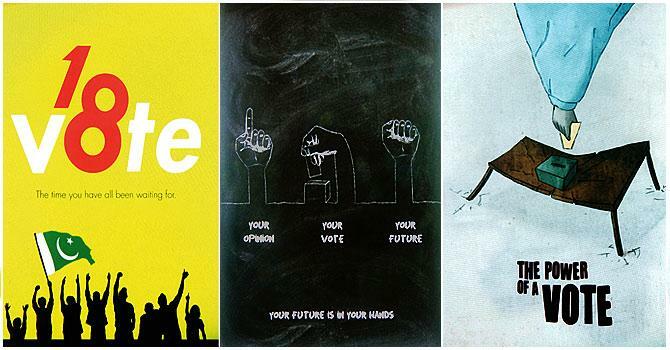 Muhammad Zeeshan’s message is a tad aggressive both in terms of design and text (vote or die powerless). However, it is youthful aggression which is brimming with love for his country. Hashaam Hasan plays with the number 18. Naturally it’s the age when one becomes eligible for vote-casting. His design highlights the number and rounds it off with the line, “This is the time you have all been waiting for.” Hazik, on the other hand, comes up with a more artistic depiction of the same topic. The young student draws the power of vote with it (positive) physical implications. the vote-casting hand speaks volumes for her bright future as an artist.